Learn English with Steve Jobs in this episode of The English Fluency Guide! 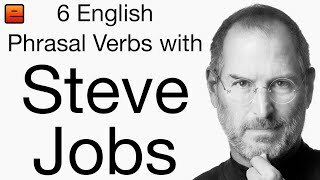 Learn English with Steve Jobs: In this episode of The English Fluency Guide, learn 6 useful English phrasal verbs featured in a video clip from Steve Jobs’ 2005 Stanford University commencement address! In this clip, Steve Jobs tells three stories from his life and explains the value of doing what you love without worrying about what others think. The 6 phrasal verbs from this lesson will help you understand his graduation speech. and it is a pleasure to welcome you to this brand new video series that helps you understand lots of great native English content around YouTube. this is the graduation speech given by Steve Jobs at Stanford University. and not waste their time. you really don’t want to, you know, listen to other people if you think you have a right idea about how to do something. You should listen to your heart. Don’t waste your time and find your own path. So listen to what’s important for you and do that thing. In this video, though, we want to focus specifically on six phrasal verbs that he uses. uh, to dismount a horse would be to get off of a horse. So we’re trying to take something complicated and express it in a casual way. really, we’re still using casual and everyday language to express ourselves. So let’s get into these six phrasal verbs that Steve Jobs uses. The first two are connected. One is to drop out and the other is to drop in. but in a casual conversational way, you can talk about dropping out of school. So think about dropping, but you’re falling out of that thing. So, instead of being in school, you’re dropping out of it. but falling out of something, to drop out of something. So, if you’re going to school and you decide, “No, I don’t want to go anymore,” like Steve Jobs did, then you are dropping out of school. Now, he also uses, in addition to drop out, he uses drop in as well. To drop into something means you’re going into something or you’re entering something in an unexpected way. instead of going to the classes that he has to go to. So, if you drop in on a friend or you drop in on a class, it just means you’re going into that thing in an unexpected way. To drop out and then to drop in. and when you talk about having a bad relationship with someone. this is a falling out. as having a falling out. So you can talk about, “Well, maybe my friend and I, we don’t have much of a relationship anymore. Next, another great phrasal verb, to side with someone. or two groups, there are two different sides. So usually, in an argument, one person says this thing and the other person says the opposite or whatever that is. And if you choose one of the sides, then you are siding with that person or siding with that team or something like that. but my dad says something else and I decide to side with my mom. argument or whatever, as opposed to my father’s. So I’m siding with her on this particular thing. to side with someone or to side with something. Next, to let someone down. when you let someone down, it means you’re disappointing them. but we’re using ‘to let someone down’. or, you know, whatever you happened to have done. they can say, “You know, Drew, you let us down. And the last phrasal verb is to screw up something. Whenever you make a mistake or there’s something wrong that happens, you can talk about screwing up the situation. and then I went to the airport and then ah, I screwed up. I picked the wrong day for my flight. So when I went to America, for example, my cousin was picking me up at the airport, but he picked me up on the wrong day. So he went to the airport and, ah, he screwed up. Well, that’s it for this video lesson. I really look forward to hearing your comments below. and then go watch the phrasal verbs in action with the link that I give you in this video. Do click that like button if you have enjoyed this video. to understand and enjoy conversational English. And now it’s time to see these phrasal verbs in action in the actual video. So please click on the link to watch Steve Jobs’ 2005 Stanford University Commencement address. 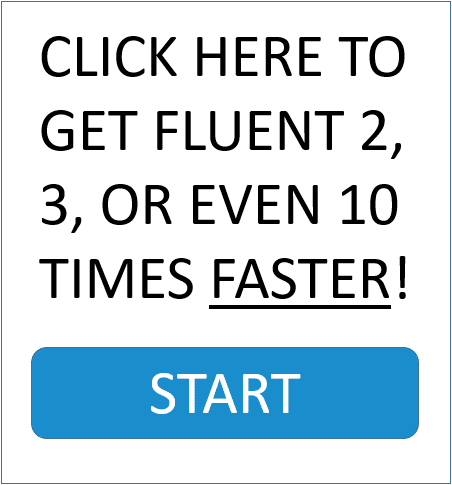 so that you can start getting fluent two, three or even 10 times faster. So click on the link in this video to enjoy that and I will see you in the next video. Have a fantastic day and keep practicing. Hi there. 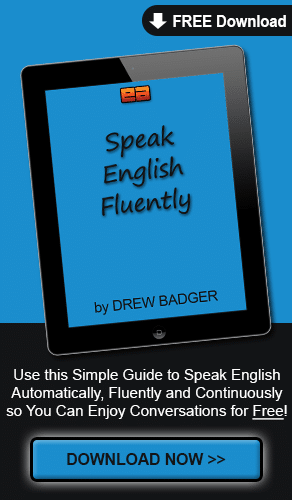 I’m Drew Badger, the world’s number one English fluency guide and it is a pleasure to welcome you to this brand new video series that helps you understand lots of great native English content around YouTube. In this video, we’ll be talking about the 2005 Commencement address, this is the graduation speech given by Steve Jobs at Stanford University. Let’s get into it. For a bit of background, at this graduation speech, Steve Jobs is delivering three stories that really help people understand how he developed and how he came to see the world and so he really, as most people do at graduation speeches, really want to impress upon all of the graduates that they should maybe think about the world in a different way and not waste their time. So the overall themes of his message is you really don’t want to, you know, listen to other people if you think you have a right idea about how to do something. You should listen to your heart. Don’t waste your time and find your own path. So listen to what’s important for you and do that thing. In this video, though, we want to focus specifically on six phrasal verbs that he uses. And the phrasal verb is just a more kind of basic way of explaining a more difficult regular verb, maybe something that would be like, uh, to dismount a horse would be to get off of a horse. So we’re trying to take something complicated and express it in a casual way. So even though a Commencement address might be a serious kind of thing for people, really, we’re still using casual and everyday language to express ourselves. So let’s get into these six phrasal verbs that Steve Jobs uses. The first two are connected. One is to drop out and the other is to drop in. Now, if you think about going to school, you can leave school, you can exit school. These are regular verbs you can use, but in a casual conversational way, you can talk about dropping out of school. So think about dropping, but you’re falling out of that thing. So, instead of being in school, you’re dropping out of it. It’s always important to think about the visual foundation of a phrasal verb, so the visual idea of falling, but falling out of something, to drop out of something. So, if you’re going to school and you decide, “No, I don’t want to go anymore,” like Steve Jobs did, then you are dropping out of school. Now, he also uses, in addition to drop out, he uses drop in as well. To drop into something means you’re going into something or you’re entering something in an unexpected way. So, he’s talking about, after he drops out of school, he’s dropping in again, going to other classes that he feels like going to instead of going to the classes that he has to go to. So, if you drop in on a friend or you drop in on a class, it just means you’re going into that thing in an unexpected way. To drop out and then to drop in. Next, another great phrasal verb, to side with someone. To side with someone. If you are thinking about having an argument or there’s a fight or a competition between two people or two groups, there are two different sides. So usually, in an argument, one person says this thing and the other person says the opposite or whatever that is. And if you choose one of the sides, then you are siding with that person or siding with that team or something like that. So maybe my mom says one thing, but my dad says something else and I decide to side with my mom. So it means I support her and I support her argument or whatever, as opposed to my father’s. So I’m siding with her on this particular thing. In a company situation, maybe you would side with a particular board member or a particular group that has an idea that they want to pursue, to side with someone or to side with something. And the last phrasal verb is to screw up something. Whenever you make a mistake or there’s something wrong that happens, you can talk about screwing up the situation. So I went to make an airplane reservation or something and then I went to the airport and then I screwed up. I picked the wrong day for my flight. So when I went to America, for example, my cousin was picking me up at the airport, but he picked me up on the wrong day. So he went to the airport and, ah, he screwed up. So he made a mistake. He made, uh, some kind of accident or did something wrong, to screw up. So when Steve Jobs is talking about, “Well, maybe I screwed up my life or screwed up my company,” this is again a regular conversational way of saying that you made a mistake, to screw up. Well, that’s it for this video lesson. I really look forward to hearing your comments below. Try posting a comment below this video and using one of the phrasal verbs you’ve learned and then go watch the phrasal verbs in action with the link that I give you in this video. Do click that like button if you have enjoyed this video. Become a subscriber to the EnglishAnyone.com YouTube channel and do share this video with other people who are also struggling to understand and enjoy conversational English. I look forward to seeing you in the next video. Bye bye. And now it’s time to see these phrasal verbs in action in the actual video. So please click on the link to watch Steve Jobs’ 2005 Stanford University Commencement address. And, if you haven’t done so already, we have a quick quiz that will help you identify your biggest fluency frustration so that you can start getting fluent two, three or even 10 times faster. So click on the link in this video to enjoy that and I will see you in the next video. Have a fantastic day and keep practicing.